All here at Lake Quinault Vacation Homes! Home of the World famous Colonel Bob and Enchanted Valley Trail. World Class Fishing, Hiking, Biking, Boating, Natural Crystal Hunting, World's largest variety of Mushrooms, Wildlife Viewing, Scenic Views, Worlds largest Trees. Peaceful, quiet and Relaxation! 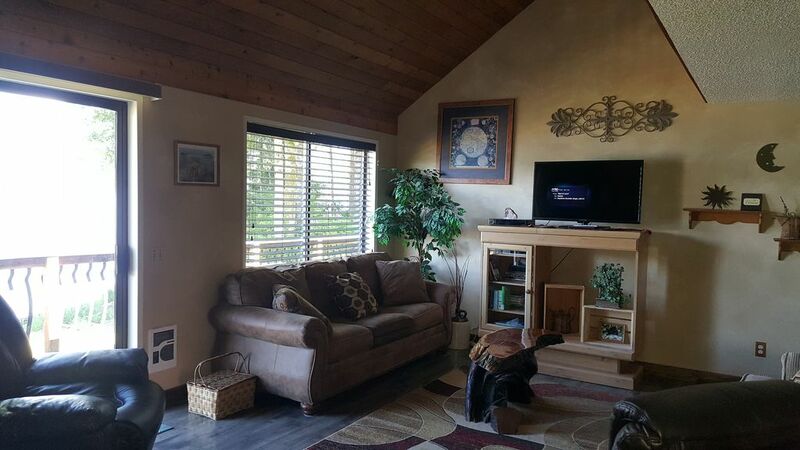 Enjoy Cottage Peaks a privately owned vacation rental nestled on the shores of Lake Quinault in the surroundings of the Olympic National Park. This property overlooks Lake Quinault, towered by the majestic Olympic mountains. This breath taking view of Lake Quinault includes wide open starry nights and year round viewing of the moon rising from behind the mountains leaving them a silhouette, creating a romantic moment. The months of September-November, the change in color of the Fall foliage is spectacular and mushrooms are galore. In the winter months you can watch the snow level creep down the mountains creating beautifully capped peaks. There is an abundance of open lakefront, with room for roaming, campfires and great swimming off the shore or dock. A soft creek flows the property line washing natural crystals from upper valley crystal mines. Chances of finding one or many crystals are in your favor! Get ready for an adrenaline rush as you witness Eagles soaring, Osprey feeding their young in the nest and otters playfully feeding from the dock as well as a passing beaver on his mealtime journey. The Rosevelt Elk can be viewed on a scenic loop drive around Lake Quinault! This sanctuary view can be absorbed from almost every room of this lovely home. There is spacious lawn area for yard games and easy access to the lake. Kayaks and a paddle board are available for your use. Fishing permits are required on the lake and can be purchased at a local mercantile. Hire one of our local Fishing Guides, Hike the nature trails, observe our Rain forest, view the wildlife and just relax! Lake Quinault is known as God's country, for the beauty of our Rainforest. Your visit here will be most memorable. Owner: Brenda Sansom has lived in Lake Quinault since 1975, graduated from Lake Quinault High School and raised a family of three daughters who also all graduated from Lake Quinault High School. Our love for this wonderful place generated from generations of both sides of the family who also lived, schooled and raised families here. With our love for nature, the great outdoors and wildlife, Lake Quinault fulfills all our activity and tranquility of our relaxation needs. Our greatest joy is to be fortunate enough to share this spectacular vacation area with people from all over the world by providing accommodations for travelers to this amazing area. Cottage Peaks is located in the Olympic National Park and a beautiful temperate rainforest with recorded world largest trees, fern beds and dripping moss as well as aboundance of wildlife. For such a beautiful place there are a minimum of accomodations for the amount of visitor in this area. I wanted to be able to offer a comfortable , clean place for people to stay and have a chance to really enjoy our area. You will benefit from a central location on the water and just be 10 minutes hiking trails and 30 minutes from ocean beaches. Also, 1hr and 15 minutes from Forks, WA (twilight location). Amanda Park has a family owned mercantile with many items. If you dont see what you want, ask. This is also where you can get your fishing liscence and tackle. Home is located in the boundaries of Olympic National Park on the shores of Lake Quinault. Quiet and private No Traffic! Quinault Indian Nation has two villages, one located in Taholah, Wa 1 hour drive and the Queets village 30 min North going toward Kalalock and Ruby Beach. The view is ever changing and never the same each day. Relax, Swim, kayak, canoe, fish, hunt for natural crystals Explore!!!! Open beam ceiling with loft overlooking down on livingroom. Sliding glass door and windows for a nice view. You just need food and people! The house was as wonderful as the incredible view! We really loved this place. The newly remodeled areas were great. There is plenty of room for a large family gather and eat/play games together. Honestly, the pictures of this place were great and yet the pictures didn't do it justice. The house was very clean and the furnishing were top notch. We will be back! Clean and beautiful outdoor areas! Great for 6 adults! Plenty of room!! Spent a nice weekend on Lake Quinault Hiking in rainforest, enjoying the beautiful scenery, even took the kayaks on the lake. The new open layout kitchen made cooking easy. Great place for family vacations or reunions. Very relaxing site and house had all amenities you could ask for. This and its companion property are my favorite vacation homes. Stayed here a few years back, and loved it so much that I decided to do it again this summer with a group of friends. Quiet private beach with a dock, kayaks, etc. Will definitely be coming back again some day. Rates are based on occupancy of 8 people. There is an additional charge of $15.00 per person over 8 people in your group. Rates are subject to change at anytime. Check In: 4pm Check Out: 12 noon Early check in and Late check out can be honored at your request if possible.